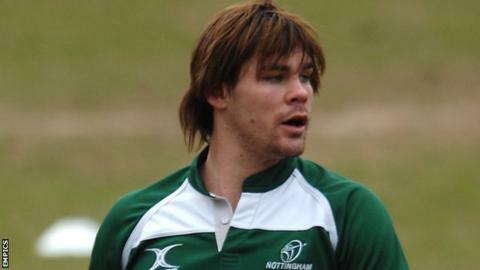 Nottingham have announced that Australian forward Dan Montagu has been named the club captain. The 31-year-old takes over the role from Brent Wilson, who retired at the end of the 2014-15 season. "Martin Haag spoke to me a few weeks back. I said I would be more than happy to do it. I was happy that he selected me," he told BBC Radio Nottingham. "I filled the boots of Brent when he was unable to play so it's a massive honour [to be captain]." The Australian is also keen to take a game-by-game approach to the new season as Nottingham look to build on their fifth-place finish in last season's Championship. "I think it is really early to say that as we haven't even played a game yet, but as a team we are trying to keep on improving," said Montagu. "It was disappointing that we didn't get in the play-offs, but we just have to look to our first game against Pirates." The new captain does, however, feel that his new role will be made easier by Nottingham's existing squad. "It's not too hard to do as these guys are highly motivated," he said. "We can see in training that everyone is looking for the same goal. We have got a lot of winners here." Montagu is also hopeful that he can remain captain at the Green and Whites for a number of years to come. "I'm up for contract at the end of the year, but hopefully we can get that sorted and I can be here for a few more years," he added.